You may sense a few themes on this blog, most notably: Weight issues, Love of food, and Weight issues. Did I already say Weight issues? So this book, which combines a couple of my obsessions, was right up my alley. 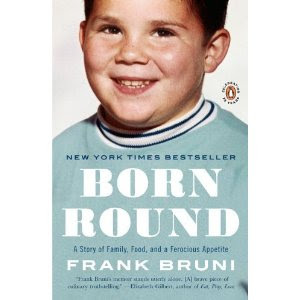 Born Round: A Story of Family, Food, and a Ferocious Appetite is written by New York Times food critic Frank Bruni, and if you are anything like me, that sentence was enough to make you want to read the book. A food critic with weight issues? Yes, please! Bruni chronicles his childhood years growing up in an Italian family, with all of the stereotypical excess that comes along with that -- massive feasts at family gatherings, and daily over-consumption in general. His explanations of his mother's and grandmother's meals were the impetus that spurred me to make lasagna for the first time in years, but all I knew was I couldn't read another word about all of the delicious Italian food Bruni was eating until I, myself, had eaten delicious Italian food. Unfortunately, I'm afraid my own lasagna likely fell far short of those made by his mother. One thing I loved about this book was that it included many photos of Bruni and his family, spanning several decades and showing how he alternately gained and lost quite a bit of weight over the years. And even though I read this book on a Kindle, the images were still quite good. Bruni is among what I believe is a rare group of men who have eating disorders, as he was bulimic while attending college. He also tried several harebrained diets, which makes him feel like a kindred spirit to me, oh daughter of Juice Diets and others that shall not be named. Another really interesting aspect of this book for me is Bruni's career as a journalist, as he explained his rise in the field and I again cursed my own lack of go-get-emness because I was certainly never on the short list for Pulitzer Prize winners. Bruni is an obviously talented and motivated reporter who covered Bush Jr.'s campaign and early months of his presidency and later worked at New York Times bureau in Rome, which, hello? I stopped reading momentarily and imagined a fictitious, kind editor (they do not exist, by the way) asking me if I would like to move to Rome and work in the bureau there. Yes, please! From Rome he went on to become the New York Times' restaurant critic, and at the moment he eats out, on average, seven nights a week. And manages to stay in shape. To struggle to stay in shape, I should say. It's a fascinating and inspiring tale. There are other parts of this book that are more personal and very touching and I will not ruin them for you but to say I surprised myself by crying at one point. Which is nothing new, really, but just so you get the picture. For Top Chef fans, Bruni recently appeared on an episode in which, when he was introduced, all of the contestants simultaneously pooped their pants. For his part, Bruni was rather quiet and actually looked slightly terrified and, in hindsight, the show didn't even promote his book, which, what the heck, Top Chef? Anyway, if you're anything like me in that you struggle constantly against two competing desires -- to eat awesome tasty food and to look thin and wonderful -- I think you'll like this book. And if you're a journalist, it's a no-brainer. Just read it! i'm finally catching up on my blog reading... gonna add this to my list of must reads as I definitely love to eat but struggle with my weigh!